Building successful products means answering your users’ needs. A Usability Testing Report is a key document that allows you to gain insight into your users’ expectations and frustrations and is crucial in evaluating your product’s success – whether it’s a physical product, a mobile app or a website. 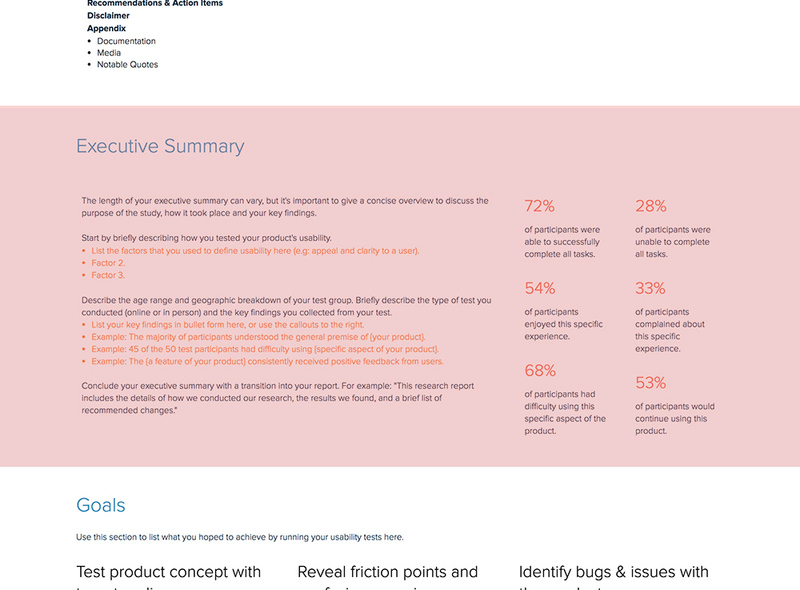 Create your Usability Testing Report - It's Free! Your starting point to create and share an effective usability testing report, without any design experience. Quick Tip: You can switch to code view in the Xtensio editor to manually add HTML anchor tags and link to different parts of your folios. Here’s a helpful article for learning more about using HTML anchors. The executive summary should give a concise overview of the report, discussing your key findings, the purpose of the study, how and where it took place. Start by mentioning how you tested the product, which methods you used, and then give details about age range and geographic breakdown of your testing group. Use statistics to highlight the main factors of the study. How many participants completed the tasks successfully? How many of them were not able to complete the task? How many participants enjoyed the study? Were there any participants who complained about their experience? Did any participants mention that they would continue using the product/service? Obviously, the report was created with specific goals or objectives in mind. Your goals should be explained thoroughly so your team can go back after conducting testing and understand what aspects of the product work and what needs improvement. Clearly indicate the main objectives you wanted to accomplish while conducting user testing. Do you want to test a specific product concept with a defined audience? Are you testing a completely new product with an audience well-versed in similar products? Are you trying to uncover roadblocks in the user’s experience with your product? Is your goal to find possible bugs or issues? So you want to test a female-focused pilates app on your target audience – professional women between the ages of 25 and 40 years old. For testing, you decide to go to several cafés throughout the work week between 3 and 5 pm. You asked women to try your app and, after gathering the research, you realized that your test group was mostly students or retired women. With this methodology, you likely put in a lot of effort and ended up with a whole chunk of unnecessary data. If you want a successful usability report to help optimize your product and reach your users’ needs, your methodology should be on-point. Explain how and where you found the participants for your usability testing. 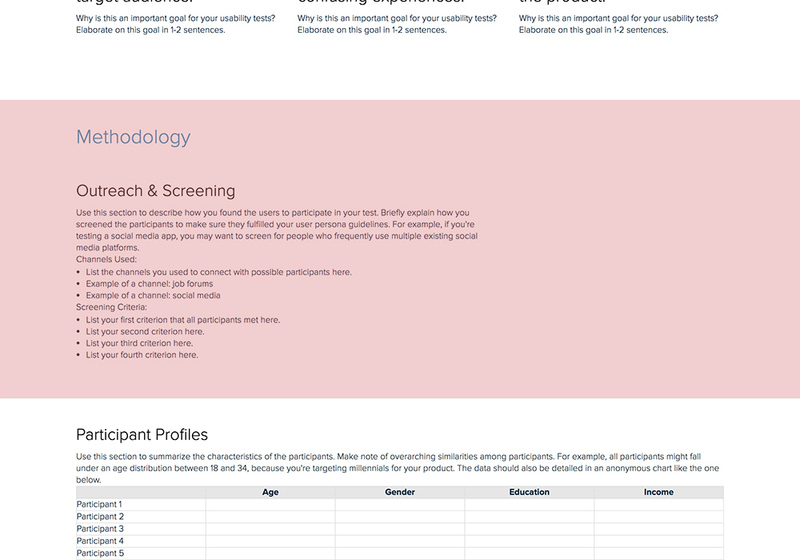 Mention your screening criteria, the channels you used and simply the methodology you followed. Was it an online approach or in-person? Give details. Bonus: Don’t forget to analyze the effectiveness of your methodology afterward to improve your process for future usability testing research. 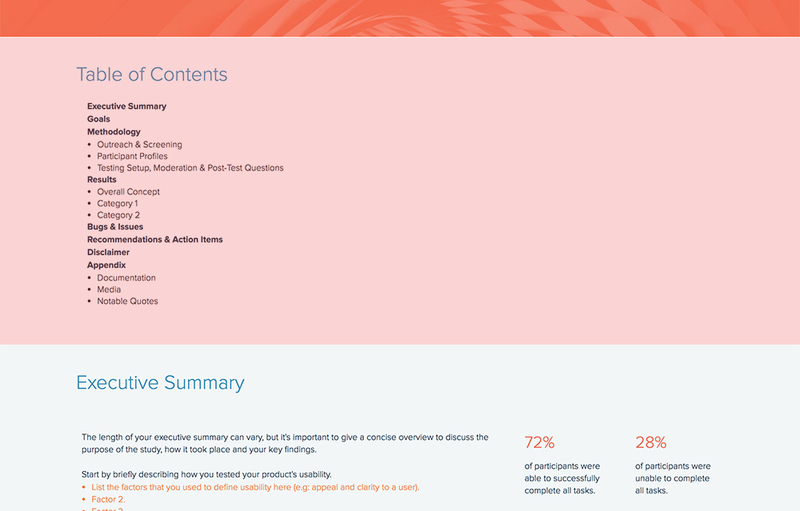 By creating your usability report on Xtensio, you can copy or move entire sections from one folio to another to streamline the creation of your next report. After outlining your methodology, describe who your participants were. Identify and mention similarities among participants, if there are any. For example, you might be targeting kids between 8-12 for your new robotics project and all participants might be under this age group. How many participants did you have? What was the overall age distribution? What were these participants motivated by (i.e. what would make them purchase a product)? What technologies were used to reach these participants? Did you take advantage of social media or only rely on traditional ads? 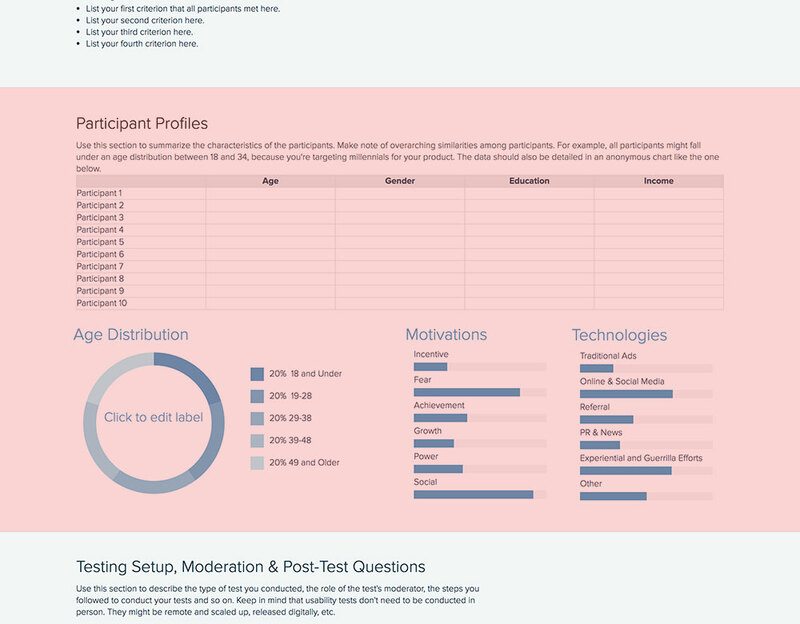 Bonus: Participant profiles should be detailed with all information crucial to understanding how this participant fits in with the overall goals of the usability testing research. Make sure your data is correct and numbers are exact. Take advantage of Xtensio’s charts and graph modules to visually showcase your data. Here, you want to explain how you set the testing up, the moderator’s role in the testing (if it wasn’t remote) and any post-test questions that were addressed to the participants. Introduction: How did the test start? What was the first step that needed to be completed by the users? What did the moderator tell users to do? Give a brief explanation of the introductory elements during testing. Tasks: How many tasks did users have to finalize and what were these tasks? For example, in order to test your new app, did they need to create an account, log in, and click on certain buttons? List all of the steps you asked your users to follow. 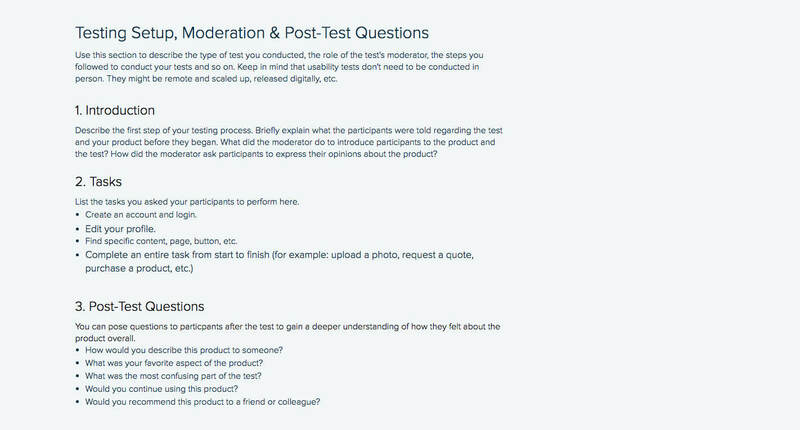 Post-test questions: If you want to gain a deeper understanding of how users are feeling about the product, you can ask them some questions after the test is concluded. You might want to learn what their favorite aspect of the product was, if they would continue using it or if they would be likely to recommend it to a colleague or client. 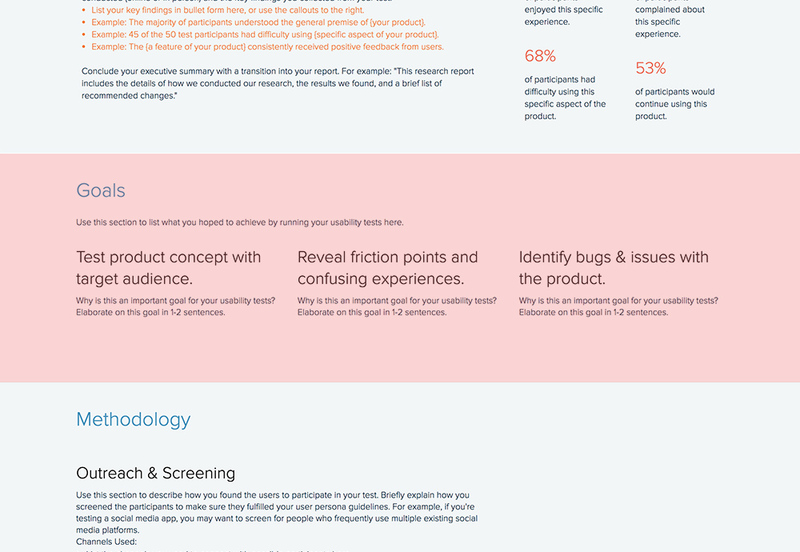 Let readers know how you organized, analyzed and synthesized all of the data collected during your usability testing research. Creating different categories to group your findings in will make it easier to understand how you came up with certain numbers and conclusions. First, indicate the overall concept and give a general overview of the results. Then show the details of each category. Use charts to highlight distinctions among result categories. 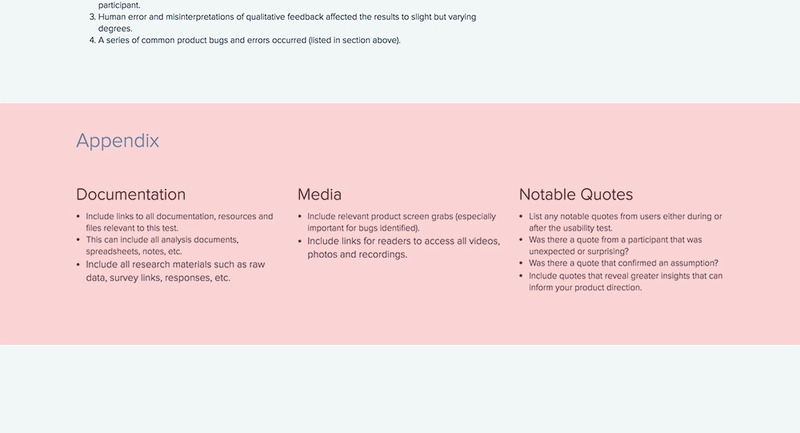 Quick Tip: At the bottom of each category, state “the Good” and “the Bad.” Remain objective and show both the positive and the negative side to the testing participants’ experience with your product. Did you see any bugs or issues during the testing process that need to be fixed? List any and all bugs or issues you found. Give an overview of the bugs or issues and divide them into categories for deeper understanding. You can also include images or videos of the issues to give your development team more reference. 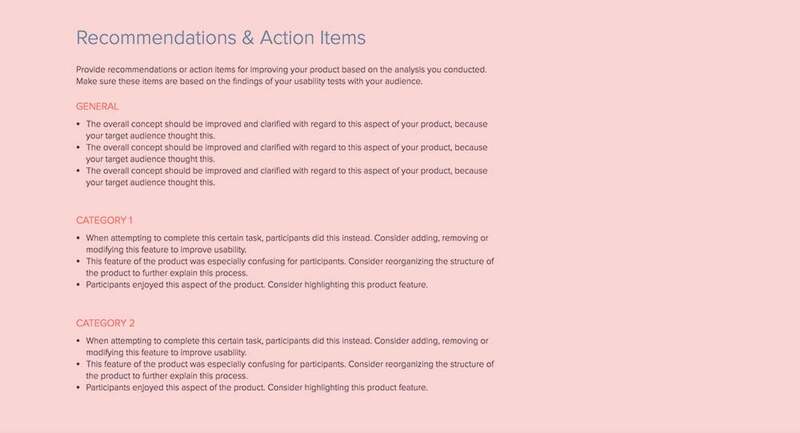 After analyzing your usability testing research, put together a list of recommendations and action items. What actions should your team take to solve a certain issue? How can you improve your product? These items should be consistent with the feedback you’ve gathered from the users during testing. Again, take categories into account but don’t forget to give a general overview. General: Do you need to improve the overall concept of your product? If yes, how? Are there any features that could be optimized to reduce roadblocks in the user’s journey? What did the users recommend and what is the best solution? Categories: What did Category A vs. Category B think about the product? Were there any roadblocks? Did they accomplish certain tasks differently? Give details. There might be different factors that affected the results of the usability testing. It’s important to identify these factors and list them on your report. Did all participants follow the set agenda? Were there any human error and misinterpretations of qualitative feedback that affected the results? Users’ biases and personal experiences might have an impact on the results, make sure to note some of the factors you came across thoroughly. You should include related links to notes, documents, data, media resources or notable quotes in your appendix. This will show professionalism, accuracy, and moreover, it will make it easier for your team to reach the resources they want to dig deeper into after reading your usability testing report. Documentation: List all links to documentation related to the usability testing. This can include research materials such as raw data, survey links or responses. Media: Don’t forget to include screen grabs, especially if you reported any bugs. Quotes: Mention any notable participant quotes, whether it was mentioned during or after the test. It’s important to include quotes that give good insight into the product and your future roadmap. Quick Tip: Conclude your usability testing report with a “thank you” note, add your logo and even a background image (i.e. the image of the tested product) to the footer. 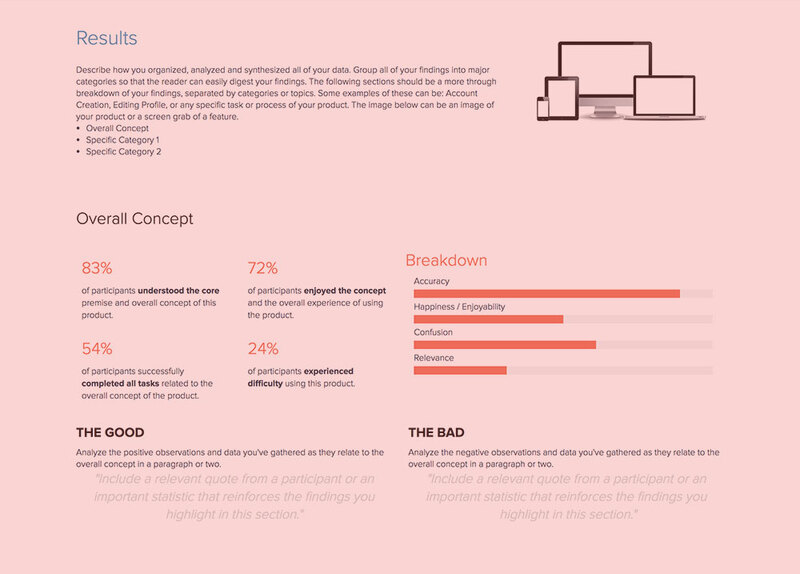 The usability testing report template is adaptable just like other Xtensio tools. It can and should be repurposed, revisited, and revised to suit your evolving needs. You can duplicate your folio to easily get started on the next one or save it as a template. And remember, all of our templates are meant to be starting points. You can always add, delete, and move your modules and sections around with Xtensio’s versatile editor to adapt the usability testing report to your needs.